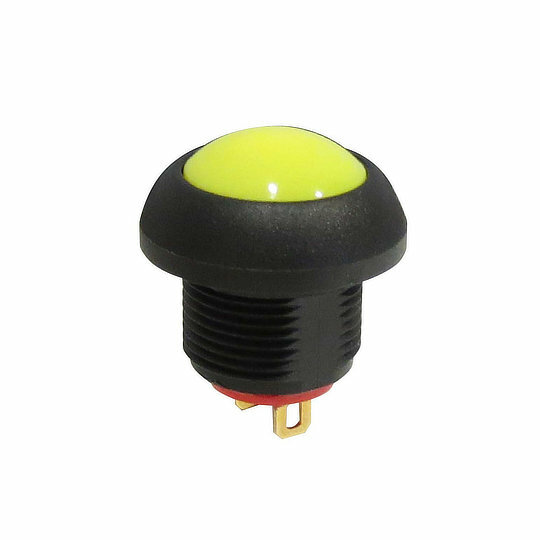 The PF series of illuminated sub-miniature pushbutton from Dailywell are single pole switches with single throw operation and momentary action. Specially designed for harsher environments the PF series is based upon the Dailywell PA series however incorporates shock resistance and is sealed to IP68. The PF series of illuminated sub-miniature pushbutton from Dailywell are single pole switches with single throw operation and momentary action. Specially designed for harsher environments the PF series is based upon the Dailywell PA series however incorporates shock resistance and is sealed to IP68. Electrically rated to 125mA at 125VAC or 400mA at 32VDC and a mechanical life of 1 million cycles. The PF series is available with flat, round or high button styles in a choice of 6 colours with or without illumination and with solder or pre-wired terminals. The PF series allows great variety for customisation making it perfect for applications such as Industrial Control Systems, Marine, Lighting, Medical Devices and Networking equipment.